2Tightly wrap sweet potatoes in foil and place on a baking sheet. Roast until very tender, 50 minutes to 1 hour. Carefully unwrap and set aside to cool. 3Line a baking sheet with parchment paper. 4Cut the potatoes in half lengthwise and scoop out the flesh, leaving a ¼-inch border (save the scooped-out flesh for another use). Place the sweet potato halves skin-side up on the prepared baking sheet. Brush with oil and sprinkle with kosher salt. Bake until browned and crisp, 20 to 30 minutes. 5Cut each skin in half widthwise and return to the baking sheet, skin-side down. Sprinkle each with 1 tablespoon Cheddar. Return to the oven and bake until the cheese is melted, 8 to 10 minutes. 6Meanwhile, make the guacamole: Mash avocado in a medium bowl. Stir in lime juice, garlic and salt. 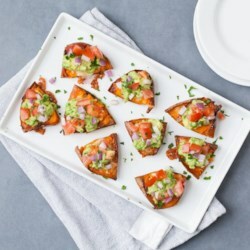 7 Top each sweet potato skin with guacamole, tomato, onion and cilantro, if desired.